In large bowl, mix sweet potatoes, 1 tablespoon of the oil, 1/2 teaspoon of the salt and 1/4 teaspoon of the pepper. Stir to coat. Place on pan. Bake 25 minutes. In same bowl, mix broccoli, remaining 1 tablespoon oil and 1/4 teaspoon of the salt. Remove pan from oven; stir or turn potatoes, and arrange broccoli on pan with potatoes. Bake 5 minutes. Meanwhile, season pork chops with remaining 1/2 teaspoon salt and remaining 1/4 teaspoon pepper. In small bowl, mix honey, mustard and vinegar. Reserve 2 tablespoons of the honey glaze. Remove pan from oven; add pork chops to pan. Brush pork chops with remaining honey glaze. Roast 18 to 22 minutes or until pork is no longer pink and meat thermometer inserted in center reads at least 145°F, and vegetables are browned and tender. Spoon reserved 2 tablespoons honey glaze on pork chops. Serve pork chops with vegetables. Make sure to use the red-skinned, orange-fleshed sweet potatoes for this recipe. 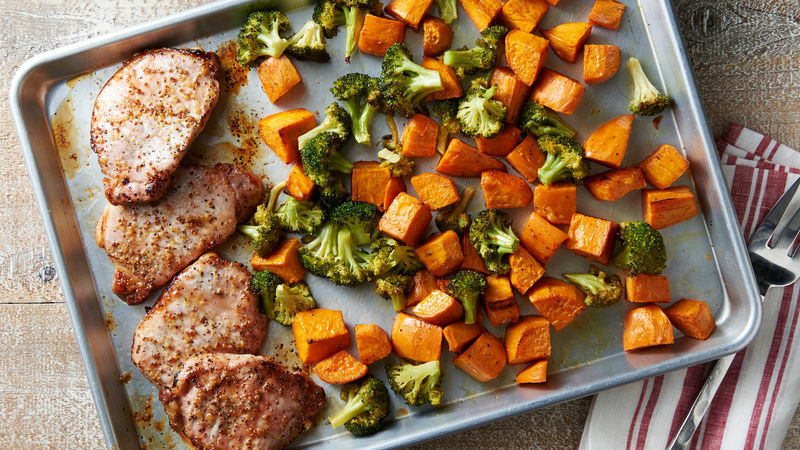 We suggest using boneless, 3/4-inch pork chops, which is what we based our cook time on, but if your chops are thicker or thinner, you’ll need to adjust the cooking time. Using a meat thermometer helps to take the guess work out of determining when your pork chops are done.